Home » Paradigm Shift! Europe’s Social Democrats Abandoning Immigration in Mass!!! Paradigm Shift! Europe’s Social Democrats Abandoning Immigration in Mass!!! In the last couple of weeks, we featured videos on Denmark and Sweden, which we saw as indicators of a mass paradigm shift going on all over Europe. Now a political paradigm shift happens when a once marginal or peripheral political policy or party moves from the margins to the mainstream, it moves from the political fringe, as it were, to now becoming the consensus opinion among a population. We argued in past posts that when it comes to the border security of their respective nations, Denmark and Sweden have almost unanimously rejected the globalist vision of the European Union and its open borders. Instead, they have shifted in mass to the nationalist populist right. In Denmark, virtually all of their political parties, both traditionally left and right, are now all vying to demonstrate to their voters that they are more conservative on border security than anyone else! In other words, in Denmark, border security and immigration is no longer a left or right issue; it has now officially and formally become PRE-POLITICAL. EVERY party is declaring the necessity of border security, and now it’s just a matter of who’s going to do it more effectively and consistently. We are seeing a similar development in Sweden, as their various political parties are all beginning to talk more and more like the so-called ‘far-right’ Sweden Democrats who are just surging when it comes to the polls; the Sweden Democrats appear to be far and away the most popular party in Sweden ahead of their September 9th elections. What is so fascinating here is that the center-left in Denmark and Sweden and their rejection of open borders is becoming more and more the model for Social Democrats throughout Europe; in other words, Social Democrats from all over Europe are taking notice here and beginning to consider implementing the same strategy. They are conceding the victory of the so-called far right when it comes to immigration and they are ready. 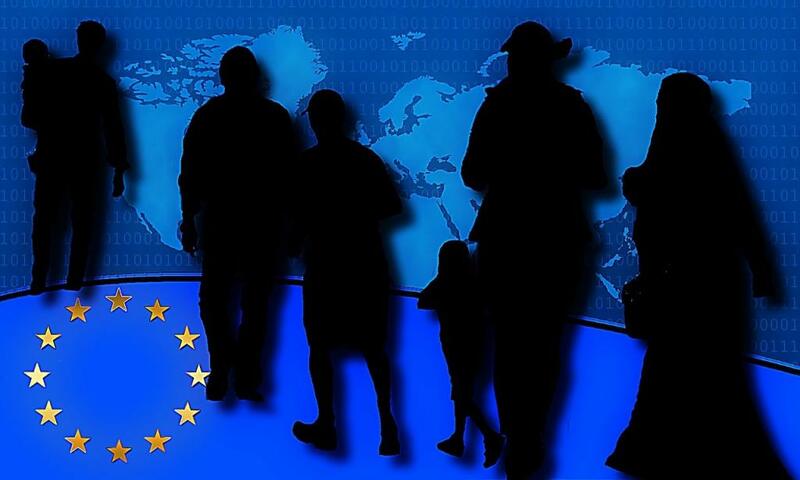 The center-left parties of various European countries are ready to drop their whole commitment to open borders and unfettered immigration and instead adopt border security and enforcement as their official platform. Last month, in June, several Social Democratic leaders in Europe attended a meeting in Amsterdam headed by Mette Frederiksen, who’s the president of the Social Democrats in Denmark. In attendance were Social Democratic leaders from Holland, Austria, Belgium, and Italy. And the whole purpose of the meeting was to establish the principles for a renewed immigration policy that would be the model for Social Democrats throughout Europe. And as astonishing as it may appear, as part of these principles, these center-left Social Democrats agreed that asylum seekers and refugees can no longer be automatically received by European nations, and that they, the asylum seekers and refugees, would have to apply for entry in processing centers and camps OUTSIDE of Europe, which is of course the agreement that was recently brokered at the European Summit last week. THESE are the Social Democrats speaking here! The social democrats were the Tony Blair-like Angela Merkel-based allies that championed a borderless globalist Europe! Now even THEY are talking like Viktor Orban of Hungary or Sebastian Kurz of Austria or Matteo Salvini of Italy. Now the SOCIAL DEMOCRATS want to get on board with border security and enforcement, which of course is the complete opposite of the American Democrats, who are doubling-down on open borders and mass immigration. And they still think that CNN and the New York Slimes are going to save them in the upcoming elections. Well, if Europe is any indicator, I think they are going to be sorely mistaken. The European Social Democrats in attendance at the meeting all recognized that the center-left in Europe is collapsing, and we can add the Democrats in America to that imploding list as well; And these attendees, along with their Danish and Swedish counterparts, recognize that the key issue surrounding the implosion of the center-left is their stance on open borders and unfettered immigration. Of course, for the various reasons that we have explored on this site, they are coming to the conclusion, as painful as it is for them, that those days are over. If they want to politically survive, they are going to have to abandon their commitment to open borders and multiculturalism as well, by the way, which is going to make it very hard for them to continue presenting themselves as representatives of the political left, but nevertheless. Now, the center-left is coming to terms not only with their own unpopularity in the eyes of more and more of the European electorate; they’re beginning to come to terms with the fact that their commitment to open borders has revealed a fundamental contradiction within their own political platform when it comes to their commitment to the welfare state. And I think this is very important for us to understand, because this fundamental contradiction is becoming more and more apparent every day among voters. More and more people are recognizing that there is a fundamental contradiction between being advocates of mass immigration on the one hand and the survival and integrity of the welfare state on the other. The political left simply cannot possibly claim to be both guardians of the welfare state on the one hand and proponents of unfettered immigration on the other. Right? Now, common sense does not seem to protect us from the need to conduct scientific studies, which were nevertheless conducted by the Danish Ministry of Finance, and this study concluded that immigration from third world nations was costing Danish taxpayers tens of billions of euros a year, which of course takes away tens of billions of euros spent on welfare and public services for Danish citizens. Well, what do you know? Hmm, how did that work out? So there is really no two ways about it; if the center-left is going to continue to dedicate themselves to the preservation and integrity of the welfare state in Europe, the center-left is going to have to support and advocate a radically restrictive immigration policy, which is also known as some form of welfare chauvinism; welfare is for the citizens of a nation only, and not free for the taking for anyone who happens to cross over their border. And in an astonishing move, which I think signals what we will see more and more of in the future, Denmark’s and Sweden’s center-left Social Democrats are adopting fully this position; they are standing up for the welfare state by cracking down on immigration. They are adopting the very welfare chauvinism that has been the hallmark of the so-called far-right for decades now. So, the fact that the whole immigration issue has exposed a fundamental contradiction within their own political platform is the first reason why Europe is experiencing this mass political paradigm shift among their Social Democratic parties. But now, let’s just be honest here: the second reason for the change is of course just the matter of political survival. We have talked about this before; we have argued that there is no way around it: Social Democrats are going to have to adopt what was once considered a far-right immigration policy and border security policy if they want to politically survive. The Tony Blair Institute’s report on European populism that came out at the end of 2017 documented the results of the 946 European districts that held political elections last year, and in 94 percent of all 946 districts, in 94 percent, the center-left coalitions lost; they lost 94 percent of the elections! Let that hit you. The New York Times has come out and admitted that the center-left parties in Europe are basically going extinct; in many parts of Europe, they are not just in retreat, they have practically ceased to exist. And so, at least in Europe, the Social Democrats seem to be getting the message. Of course, there is the fundamental problem that all of these center-left, Social Democratic parties are facing: in a representative parliament, they have traditionally caucused with the Social Liberal Party, which is what our own Democratic Party is becoming; and the Social Liberal Party is absolutely dedicated to open borders and multiculturalism. And so, the Social Democrats could win the most seats in parliament but still not be able to govern, since their ultra-liberal coalition partner would stand up for an immigration policy that the Social Democrats campaigned against. Time will tell what these other nations are going to do about it, but we reported in an earlier video that the Social Democrats in Denmark have already promised that they will not form a coalition with any other leftist party; they are officially joining up with the nationalist right when it comes to Denmark’s border security and very, very strict immigration policy. All of this is to say that when it comes to the whole issue of open borders and mass immigration, Europe really is experiencing a major paradigm shift. Even the traditionally leftist Social Democrats are abandoning their support for open borders and adopting an immigration policy that just a few years back they themselves were demonizing as fascist and far-right. When you combine this political shift with the concessions made at the European Summit just last week, with their abandoning any notion of immigration quotas and setting up refugee camps outside of Europe, it certainly does appear that the European nationalist right is not just winning. The European nationalist right has already won. The “Promethean man” (the New World Order) hates Russia with all their strength but tries to conceal it with hatred towards Putin. US-Russia Reset or the Liberation of Europe?